Ask The Bellwether: How does a beginning spinner control overspin? How does a beginning spinner control overspin? 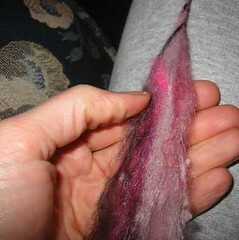 When you're first starting out with spinning, there's a tendency to add alot of twist as you spin fiber into yarn. That's not necessarily a bad thing -- great novelty yarns come from high twist, like coil yarns and cable yarns. But, you may simply be shooting for a nice singles yarn. One of the things I remember from when I was learning to spin, was fighting overspin. To overcome this, I pushed myself to the other end of the curve, underspin, by putting only a little twist in and then tugging -- if the not-yarn drifted apart, then it wasn't yarn yet. If it hung together, then it was yarn! So try putting in just a little twist, tugging, and seeing if it drifts; repeat until it stops drifting, and then you'll have the minimum amount of twist to make it yarn. That low-twist yarn makes great singles! 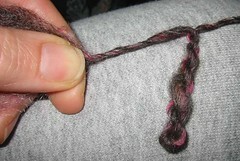 But for plying you'll want to put in enough twist to make it "pretty" as a 2-ply. I recommend the ply-back test for measuring the "pretty". For more information on controlling twist in singles, see my entry How do I make sure my singles aren't underspun? Joins are often a high-twist area. That's okay, really, as it helps them hang together. But if you want to avoid a high-twist join, make sure you have enough fiber in the old end and in the new end that they can be drafted at the same time. This will help make the join practically disappear -- and only "need" as much twist as the surrounding fibers to hang together well. ... Enclose the new segment in the V from the old one. From here, you draft the old and new together, and you have an excellent join! Once you draft the V and new segment together and twist moves into both fiber sources, the join is formed and you are off and spinning on the next segment!